USPA NEWS - Friday June 29 was an Historic Day for Fairchild Tropical Botanic Garden as Two of the Four New Varieties of Plants headed to the International Space Station (ISS) were selected by Middle and High School Students through Experiments coordinated by Fairchild. 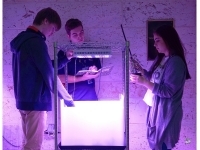 Friday June 29 was an Historic Day for Fairchild Tropical Botanic Garden as Two of the Four New Varieties of Plants headed to the International Space Station (ISS) were selected by Middle and High School Students through Experiments coordinated by Fairchild. SpaceX CRS-15 launched early Friday morning, carrying Several Science Experiments including Seeds for testing in NASA's Veggie Growth Chamber. Two of the Plant Varieties, 'Dragoon' Lettuce and 'Extra Dwarf' Pak Choi, were chosen based on the Results of Fairchild's Growing Beyond Earth Classroom Science Program. Today's Launch represents Three Years of Intensive Research by Fairchild and more than 15,000 Students. "This Spectacular Pre-Dawn Launch of SpaceX CRS-15 carried Seeds of Edible Plants selected by South Florida Students involved in our Growing Beyond Earth Program," said Carl Lewis, Ph.D., Director of Fairchild Garden. "Extra Dwarf Pak Choi and Dragoon Lettuce performed well in Classroom Experiments. Now we'll see how well they grow on the International Space Station." Fairchild's Partnership with NASA has engaged Thousands of Middle and High School Students with the Space Program and taught them Science, Technology, Engineering and Mathematics (STEM) skills. The Students constructed and used a Plant Growth System that approximates Conditions found in the Veggie Growth Chambers on the ISS. They followed Research Protocols to measure and record Data on Plant Growth, which Astronauts will put to the Ultimate Test in Space. * Photo (1) : The second stage of SpaceX CRS-15, as seen from NASA Kennedy Space Center, Cape Canaveral, Florida, carrying new science experiments toward the International Space Station. * Photo (2) : Students conduct research for NASA at Fairchild Challenge events held at Fairchild Tropical Botanic Garden in Miami.